PC gaming is on the rise… if the popularity of Valve's Steam platform is anything to go by, that is. 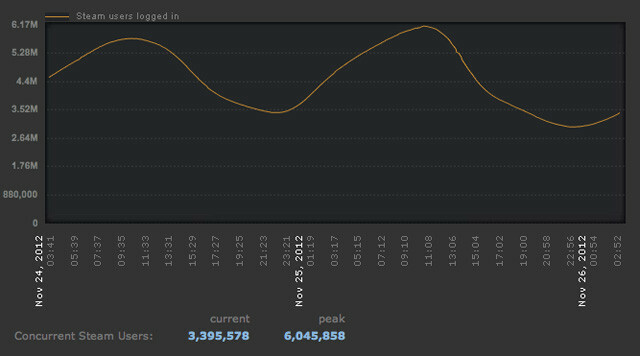 Over six million people were simultaneously logged into Valve's digital distribution service this past weekend, the highest number it has ever seen. The five million mark was reached in January 2012, a figure many attributed to the release of Skyrim. Perhaps Nvidia hit the nail on the head when it said PC games would outsell console software by 2014. Sceptics say that Steam typically starts up automatically when users boot up their computers, and the fact that these figures peak in the morning would seem to corroborate this. Still, regardless of how many people actually play games when their Steam accounts are open, the growing number of users is a sign PC gaming has more than its fair share of honest buyers.